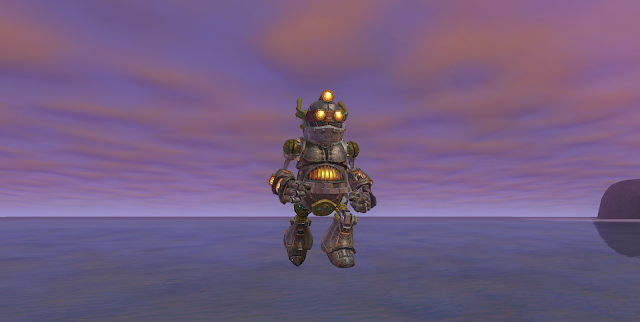 I haven't logged into EQ2's Beta Server yet but I have been browsing the forums, where the tone is markedly different from the grinding negativity of Live. Similarly, the /Test chat channel, which I've been in for a decade and more following my five year residency on Test as my main server, has been buzzing with positivity as the stalwarts there take a run at the next Holiday on the rank, Hero's Festival. The EverQuest games have always benefited from a strong culture of dedicated service among a subset of players, those who have always understood that MMORPGs are a collaborative hobby as much as a commercial enterprise. From the Guide program, through well-established, permanent Test servers to an extensive and well-organized beta process with a full supporting incentive and reward structure, determined, invested players and developers have co-operated to build the best games possible. 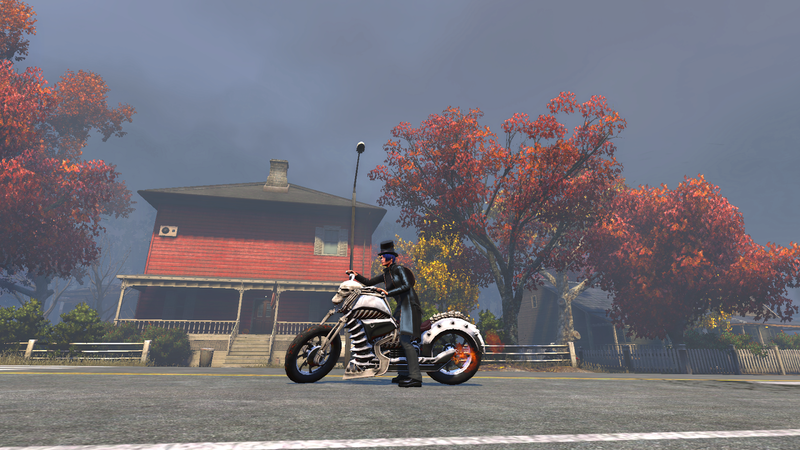 The latest iteration of this worthy and welcome process is the Daybreak Insider program. I haven't signed up yet but only because I'm not sure I can offer the time and commitment just now. It looks like a good way to become involved in the future direction of the MMOs we play and enjoy, not to mention getting some insider gossip and advance knowledge. I wonder if there's an NDA? The reason I was on the Beta forums this morning was to see what people were saying about crafting. While I have four Level 100 adventurers ready to go and an instant Level 100 token in the bank, I only have two max level crafters. The Collector's and Premium Editions of Planes of Prophecy both come with the first ever Tradeskill Boost but I didn't buy either of those and I'm not going to upgrade. In any case, it's not getting to the starting line that concerns me - it's getting to the finish. The last few expansions all came with fully fleshed-out crafting questlines that matched the adventure version in depth and complexity. Well, almost. They were substantial and satisfying, anyway, and for every expansion since Velious the crafting line has been the one I completed first. That was when we still had Domino. Now that she's gone back to Canada things are different. I'm not even sure EQ2 has a dedicated Tradeskill dev any more and we already know there won't even be a Signature Tradeskill Questline when PoP launches. It's scheduled to be added in an update at an as-yet unspecified later date. Nevertheless, we'll be getting ten more levels on November 28th. With no questline to bump up the xp, my Weaponsmith and Sage are both going to have to settle down at workstations and grind writs. According to the Beta forums, at the moment that's a mountain to climb. There was a brief period when crafting xp flowed like water but that was because of a beta buff. Once that was switched off the complaints began to pour in. "The reason we turned off the beta bonus xp is so that we can get an accurate picture of how it would be on live, and adjust as required". "You need to do level 100 or higher rush orders or work orders. (Only level 100+ have the new xp rewards on completion) *Currently* they're using Maldura recipes for the level 100 ones and not everyone bothered to get those recipes. This is temporary. They've cobbled together a leveling path for all the eager testers while they're still working on the real writs, and some other crafting goodness for us. We've got a month - they ARE making progress, we're just trying to progress faster than they can keep up." Isn't it always the way? Players burn through content so much faster than developers can churn it out - even in Beta. but unless you plan on buying all your mats from the broker (very expensive) you're going to need at least one maxed-out harvester to go and get the stuff. Or maybe not. These days anyone can gather or mine or lumber or fish. The minimum skill levels were removed a while back. All that happens now, when you harvest a node well above your skill level, is that you fail a lot. Which is fine, because you also get a skill-up on most attempts, successful or otherwise. So, you can go out and gather the mats you need if you have the patience and skill up while you're doing it. It's a monumentally slow process though. And you don't get any rares at all until your skill passes the former threshold. I spent an hour this morning harvesting in Sinking Sands with my Level 100 Inquisitor who is also a Level 50 Carpenter. She was boosted from nothing to 100 and has never done much field work. With a cap of 500 based on her Adventure level most of her skills were in the 20s. After an hour they're all around 100 and she has enough mats to do a few levels on Rush Orders. Too lazy even to get off the horse. I could find out what the relevant trade questline is for her level and go do that. If there is one. I'm not sure there is. It depends who the tradeskill lead was when the game was going through the fifities. If it was Behn there'll be nothing. If I did, though, she still wouldn't have the harvesting skills because most craft quests provide their own mats or don't use any. 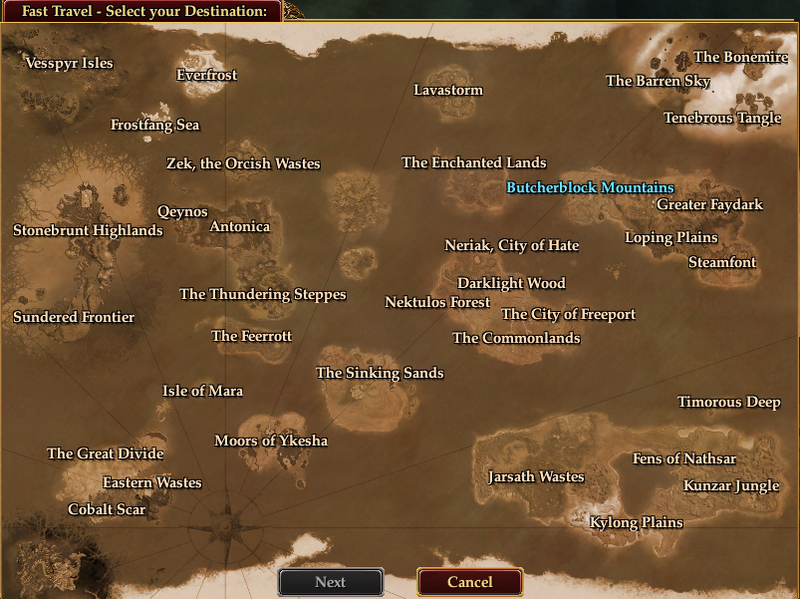 There's a whole separate Harvesting questline - several in fact - that I could do to catch up. I've written about that before. It's very good. Maybe I'll do that. Only, harvesting is really relaxing. And fun. And satisfying. It is in most MMOs but especially so in EQ2. What's more, if you're catching up on a level 100 in older zones, everything's gone grey. The wildlife wanders past you and leaves you alone. You can drift. 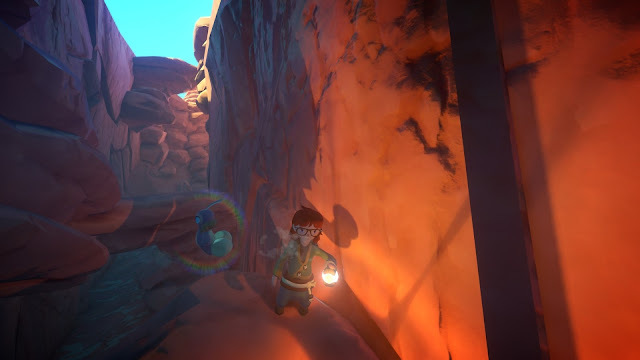 Even in level-appropriate zones at 100, geared up from the last expansion, topped out with panda hand-me-downs and guarded by an equally well-turned-out mercenary, there are precious few interruptions to the zen-like calm brought by knocking chips off rocks. I took my Berserker around Phantom Sea and Obulos Frontier for a couple of hours on Saturday, buffed up with an old potion I dug out of the bank that came from when I was still religiously doing my Crafting Apprentice quests every day. With maxed skills, harvesting AAs and items and the boost my Berserker/Weaponsmith has a 27% chance per strike of getting a "Bountiful Harvest" (more stuff) and a 9% bonus to his chance of finding a Rare. It was Rares I was after, looking to supply my Warlock/Sage so he could upgrade his, the Necro's and the Inquisitor's 90s spells to Expert before the expansion lands. It was a very successful run. I came back with eighteen rares. Naturally, only two of them were the specific rares I needed but if necessary I can sell the wrong ones and buy the right ones with the proceeds. I won't though. I'll end up using them all. I also bagged some rares I didn't know what to do with and after investigating them I realized I barely even understand EQ2's spell progression any more. Or the augment system. Or the various upgrading options for gear. It's so ferociously overwrought after fourteen years of continual development I'd be amazed if anyone knows what's going on. And that's the fun of it. Come the new expansion it'll be all change again. I'm going to try and catch up then, in theory if not in practice. I can hardly wait! All of which means this probably isn't the best time to be revisiting old systems and trying to remember how they work. I think I'll just go and hit some rocks. That, at least, never seems to change. 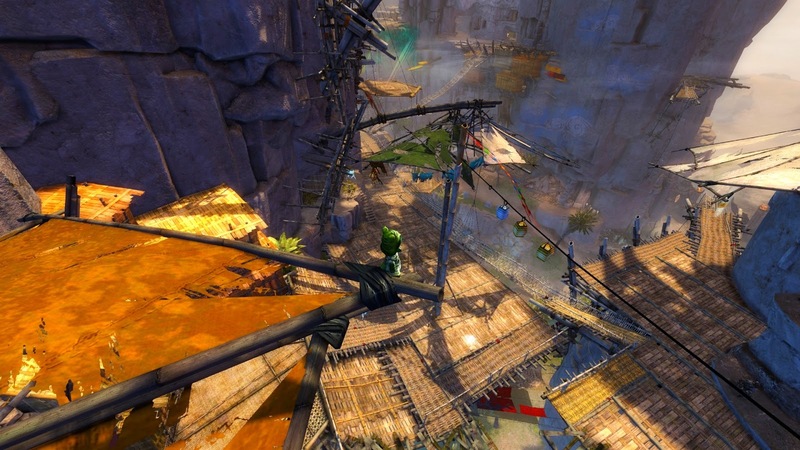 GW2's business model is based in large part on selling "cosmetics" in the Gem Store. 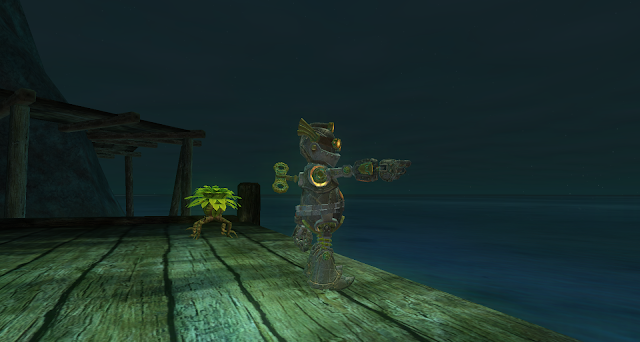 The idea is that players pay real money to purchase Gems with which they then buy outfits, pets, skins and the like. Utility items like harvesting tools are gussied up with effects to appeal to players' vanity and a way has even been found to add visual flair to services such as in-game mail - for a price. It's not just the business model that runs on looks. With no real vertical progression to speak of, either in gear or levels, bragging rights, such as they are, come as much from how you look as what you can do. Legendary weapons and armor, which take a very great deal of time and/or money (usually both) to acquire are no better at killing mobs or protecting players than their much easier to get Ascended equivalent. The point (apart from stats that you can switch on the fly) is for other people to see you wearing or wielding them. My problem has always been that I think most of them look bad and would make my characters look bad. The Legendaries, with a handful of exceptions, are either pompous and overwrought or downright idiotic. Almost all high-level armor skins are even worse. Just browsing the style tabs of the Wiki or Dulfy is enough to dissuade me from making the effort and as for the never-ending stream of tat coming out of Evon Gnashblade's Emporium aka The Trading Post aka The Gem Store - well, the less said about that, the better. So, when something finally does appear that fires my imagination and makes me reach for my wallet I think it deserves to be mentioned. And it happened this weekend. Or to be accurate I noticed it this weekend. It probably happened when Halloween arrived a couple of weeks back but since I'm not in the habit of browsing the fashion shelves and since Mrs Bhagpuss, who is, hasn't played for a month, it was pure chance that I happened to catch sight of the promotional banner when I opened the store to start selling. In five years, apart from upgrades to my account like extra character or inventory slots, about the only things I've ever bought from the Gem Shop have been "toys". 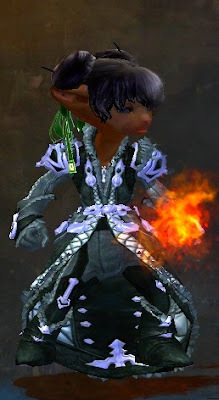 Toys, in GW2 parlance, include Minis (short for Miniatures. which is what ANet call vanity pets), musical instruments, kites and balloons. The category also includes things that you ride around on that are definitely not mounts, oh no! 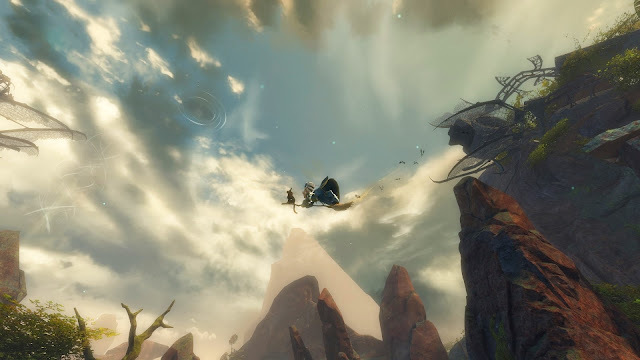 In the long years when ANet denied such a thing would or could ever become a feature of the game, players jonesing for a ride had to make do with a Magic Carpet that moved at regular running speed. As well as the carpet there was a tunneling drill and a sparking electrical storm... I bought them all. The only one I didn't buy was the broom. Either I kept missing it when it was around (because Evon likes to swap things in and out of his warehouse to create imaginary scarcities) or I just wasn't in a buying mood when it appeared. Then yesterday morning I happened to see a cat. See a cat, want a cat is the way that goes, for me and for a lot of people, which is why you see so many cat-shaped things in stores both real and virtual. And it works. All Anet had to do was put two small triangles on top of the existing Commander tag and call it a "Catmander" and people were queuing up for WvW who'd never killed a player in their life. 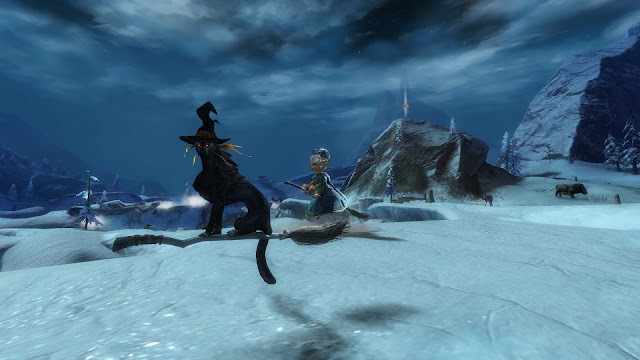 This time it was "An Elonian Familiar", a strange black cat with orange "whiskers", ready for Halloween in a witches hat and riding a broomstick. Cats wear hats in Tyria. Last year I got the "Feline Familiar", a sleek, midnight-black cat that also wears a witches hat, albeit with significantly more elan. Last year's cat has been padding alongside my Necro ever since but since she's the one who does all the busywork every Halloween she thought she deserved the new one, too. It was then, as I was looking at the price and deciding whether to stump up the 400 Gems, that I noticed the same cat looking at me from another store window. ANet like package deals. They're always bundling things together, usually things that seem like a worse deal in a bind-up than they would be on their own. This one was different. It was good. 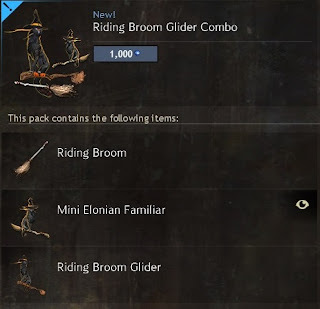 For 1000 Gems you can get the new mini, the Riding Broom and a broomstick skin for your glider. Now that's a decent offer, especially when you consider I was already going to get the mini, I've on-and-off wanted the broom for five years and I have had more fun and enjoyment out of the Magic Carpet glider skin I bought a while back than pretty much anything in the game ever. A thousand gems is a lot. I don't think I have ever spent a thousand on a single item before. 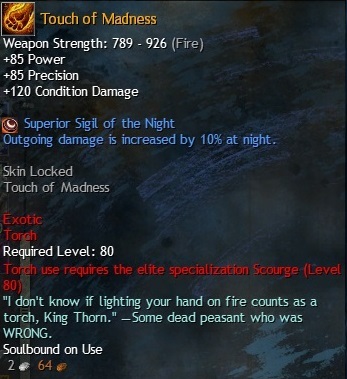 If you were going to buy them with real money it would cost you $12.50 - except you'd have to buy $20 worth to get a thousand because ANet only sell Gems in multiples of 800. Are an imaginary cat, an imaginary broomstick and another imaginary broomstick worth $12.50? I don't know and I don't care because, of course, I bought them with Gold. I still don't entirely understand how game companies make a living selling virtual goods when they also allow you to buy said goods with virtual money as well but I'm not complaining. Due to the aforementioned extreme shortage of anything I want to buy I have a lot of savings in my Tyrian bank account. Until yesterday I had over 6,000 gold on my main account and about 2,500 across the other two. It's a bit less than that now. Before I bought anything, though, I went and told Mrs Bhagpuss. As I said before, she hasn't played GW2 for a month. In fact, since we got back from Italy she's played exactly once. 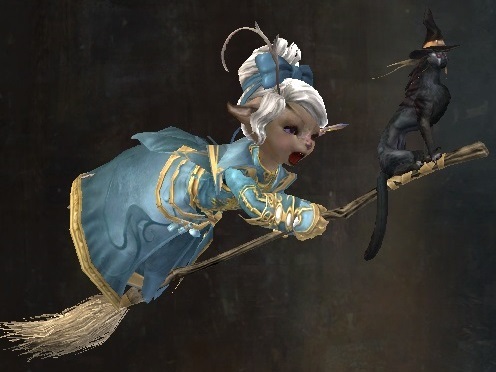 I had a suspicion she'd be somewhat miffed if she decided to start up again in a few weeks only to see me promenading around on a genuine flying broom with a cat on the front (did I mention the cat rides on the broom you use as a glider? No? Well it does!). So, I told her about it and she took a look. Then she logged in, graciously allowed me to gift her the pack since she was, as always, broke, did the Halloween dailies, interrogated me about the new Halloween weapon skins and armor set, farmed the Labyrinth for about five hours and logged out. When I woke up this morning she was already in the Lab doing the dailies again. I bought the pack on two of my three accounts. The screenshots are from my second account, the Ele modelling. It's remarkably hard to get screenshots of Minis since they move about to keep a certain distance form your character. It's even harder to get screenshots of a glider in flight. And finding a clear, uncluttered backdrop is the hardest thing of all. Consequently it's not as easy to point out the best features as I wish it might be. There are several really excellent flourishes in the detail. With the broom equipped as a toy and selected as a glider skin you appear to be broom-mounted at all times. The transition from ground to air is neatly covered in a flash of lightning that works wonderfully to distract the attention in true sleight of hand style. 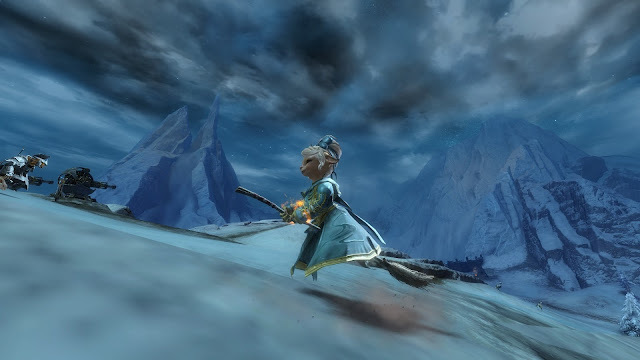 In flight, the broom trails bats but the very best part - the thing that above everything sold it to me - is the outrageously joyous expression on my Asura's face. It makes me happy just to look at her. Whether it will look so convincing on a Charr I have yet to discover. I suspect not but it should be funny. So, there we have it. That one item got me to spend 3000 Gems (actually about 750 gold at the current, very reasonable, exchange rate) and brought at least one wandering player back into the fold. Here's hoping we get something as appealing for Wintersday. I should have replenished the coffers by then. In a serendipitous sequel to yesterday's post on non-MMO gaming, this morning I clicked the link from Atherne's Adventures to nominations for 2017's Golden Joystick Awards. Most of them I'd never heard of, unsurprisingly, but a few names I recognized from brief flurries of attention they'd enjoyed on various blogs I'd read over the last year. What did surprise me was how quickly and completely whatever attention those games received in this corner of the blogosphere had shriveled and died. It's not even as though people had reported on their endings or their play-time coming to a close. Did anyone finish Horizon:Zero Dawn? I remember several people starting but that's about all. I know someone was posting about Final Fantasy XV because I recall being curious about the apparently contemporary setting. Never heard any more about that one. I could kill for a rum punch. 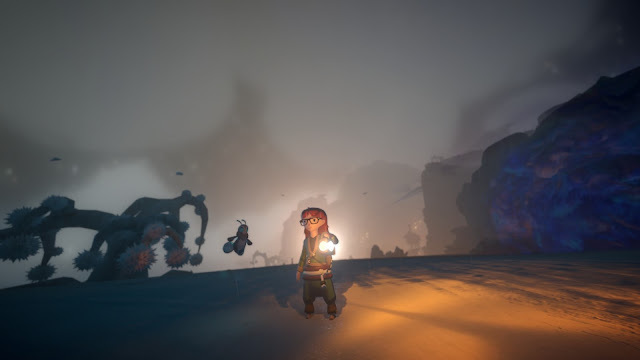 Much was made of The Legend of Zelda: Breath of the Wild, with its open-world gameplay that was either compelling or purposeless depending who you were reading at the time. Several people seemed to have bought the Nintendo Switch just to play it but other than a couple of tales of buyer's remorse I never found out how all that ended. Mass Effect: Andromeda might be the only exception. At least a couple of people blogged the whole of that journey, not just the amusing visual glitches and the bad launch horror stories. Other than that, the games that keep coming up, the ones I was reading about last year, read about this year and will almost certainly read about next year, are all MMOs. Various kinds of MMOs, certainly not all of them MMORPGs, but the genre's a broad church, wide enough to embrace PlayerUnknown's Battlegrounds at one end and FFXIV at the other. It's something even the creators of the Golden Joystick Awards recognize: in the "Still Playing" category, defined as "...your chance to celebrate the games that have held your attention for years or even decades after release" almost half the nominations are MMOs. More than half if you want to count Diablo III and Overwatch. Of the two non-MMO games I bought this year, no-one else ever mentioned Tanzia and I'm pretty sure no-one wanted to hear me going on about it either. I was browsing the always-fascinating Steam Charts last night and I noticed that Tanzia's all-time peak concurrency on the platform was ten players. That's ten. Not ten thousand. Just ten. Although right now I imagine ten players online at the same time would be living the dream for developers Arcanity Inc. since September's average concurrency was 0.07 of a player with a Peak of three. And as far as I can tell, Tanzia is only available via Steam. Yonder, the other game I bought, did much better, with an all-time Steam Peak just shy of 1300 players and a September average of just over 45. 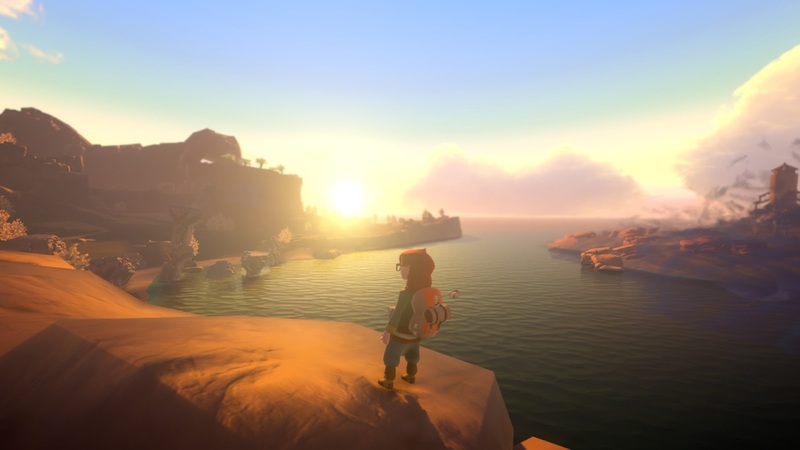 You can also buy and play Yonder outside of Steam as well as on the PS4 so that's just a portion of the audience. Still, it hardly represents the break-out hit and potential phenomenon I thought it was going to be when I jumped the bandwagon back in July. Every MMO has to have a zone called "Crossroads". It's the law. Only this isn't an MMO. It just wishes it was. Contrast those numbers with 2017's genuinely unexpected breakout, PUBG. Featuring heavily in the Golden Joystick Awards as "one of the year's biggest success stories", the survival arena phenomenon currently tops the Steam chart with a staggering 2.39 million players all playing at the same time. With room to improve, because that record was set yesterday and the numbers are still trending upwards. PUBG's concurrency has increased inexorably since it appeared seemingly out of nowhere in March, almost doubling month on month. I haven't played, just like I haven't played the game that seems likely to have suffered the most from PUBG's meteoric rise, H1Z1. 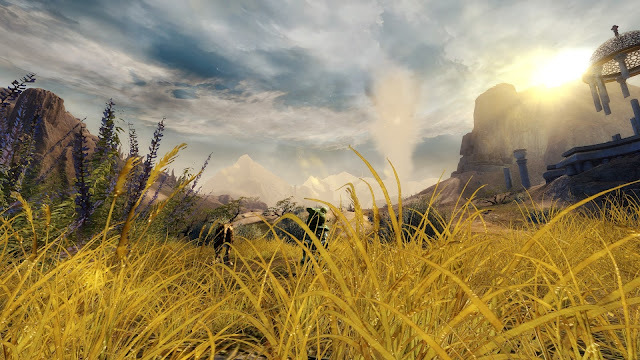 Arena survival is hardly my thing, although ironically I played three games of Southsun Survival for dailies in GW2 yesterday and, as someone said in chat during one of them, "ANet invented PUBG years ago". Bad things happening to H1Z1 always worry me, not because I have any interest in or affection for the zombie slaughterfest but because I imagine it's the Catalonia to DBG's Spain, doing most of the hard lifting and paying most of the bills. Certainly that won't be Planetside2, currently languishing at #154 on the chart. Although perhaps "languishing" isn't the right word. Not at all. That placing still represents four thousand players at Peak and nearly half that on average. And again, PS2 is available through other channels than just Steam. H1Z1: King of the Kill (soon to be rebranded without the unfortunate, foreign revenue sapping corollary) is still in the Steam Top Ten. Just. Number nine and falling, with a September Peak of 105,000 players but a current 24-hour high of less than half that number. I hate to be the one who has to break it to you but that really isn't an Ice Shard. Still, it's a lot of people. I knew H1Z1 was popular but I hadn't quite realized just how successful it was and still is. Back to PUBG, success that fast and on that scale changes everything. Amazon's Breakout won't be the only project going on hiatus or worse, I'll wager, as executives around the world try to figure out how to get some of that sweet PUBG action. Brace yourselves for another half-decade of WoW-killer hype, only with "WoW" airbrushed out and "PUBG" scribbled in. One day this will all be yours. Oh, wait, it already is. The perhaps ironic upshot of all this is that I might, finally, get around to downloading the original H1Z1. 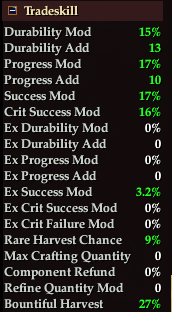 The re-purposed Just Survive is beginning to look quite interesting. As for the many nominees for the Golden Joystick Awards, though, I'll probably pass. Except, maybe, for a couple of the Indies. The annoyingly-named Everything looks intriguing. 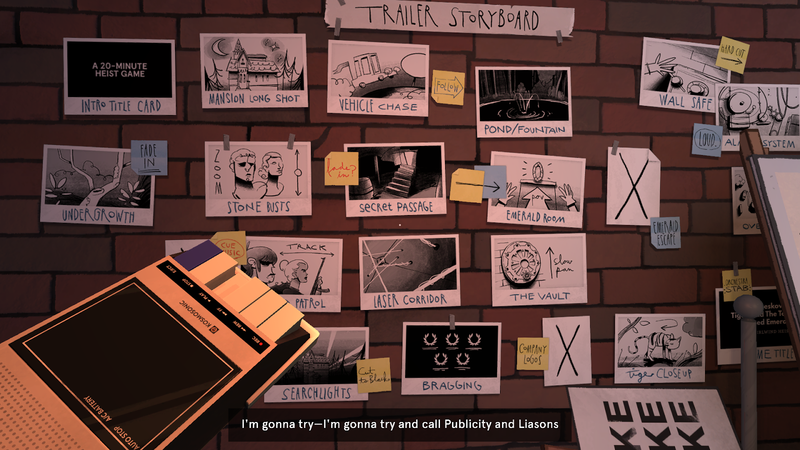 Thimbleweed Park, with its curious USP of "Monkey Island meets Twin Peaks" could be worth a try. In fact, I could imagine playing and enjoying any of the ten entries in the Best Indie list, which is not something I could say with a straight face about many of the various AAA nominees. Aywren offered an early entry in the inevitable swarm of "what I'm looking forward to in 2018" posts but right now the only game on my radar that's guaranteed to launch next year is We Happy Few. I was fairly sure I'd get that but Compulsion Games' decision to go full AAA with a launch price of $60 has made me think twice. I'm not really price-sensitive when it comes to video games but bearing in mind what I said yesterday about Tanzia and Yonder it does seem like a good way to throw money down a hole. Nope, I think I'll stick to my MMOs for now, and my old MMOs at that. 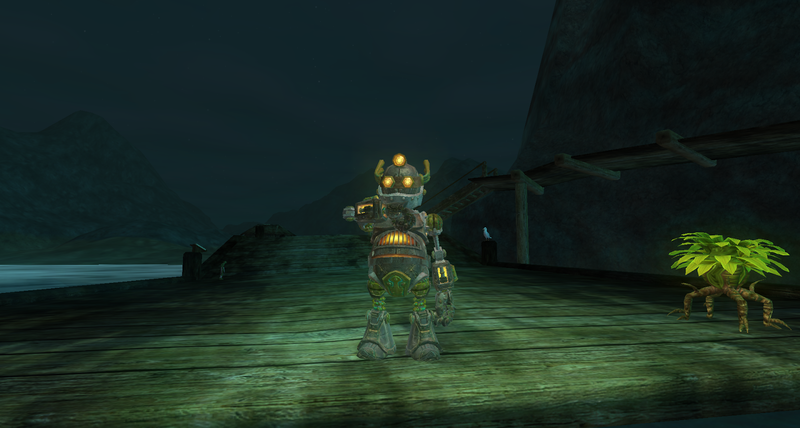 I played a lot of EQ2 yesterday and it made me want to play a lot more. I know I don't need any new games but right now I'm not even sure I want any. Maybe we already have enough games. Anyone ever think of that? Every single post on Inventory Full, well over a thousand now, carries the tag "MMO". When I started writing here, back in 2011, almost every blog I read was much the same - all MMOs, all the time. A lot of bloggers still write more about MMOs than any other kind of game - Syp, Wilhelm, Isey, UltrViolet... too many to list, really - but mostly these days it's a mixed diet of MMOs, co-ops and single player stuff. Which is fine. My interest lies more in the quality of the writing than the topic anyway - I enjoyed Tipa's blogging on bridges as much as her MMO coverage, for example, but then I'd just be happy to see Tipa back blogging about anything. If I was going to start blogging about anything other than MMOs I would move away from gaming completely. Most likely to music (which would give me a chance to enthuse openly instead of just dropping allusions no-one will ever get into blog titles) or books (since I get to read a wealth of wonderful stuff six months to a year before it's published) or even movies (although for that I'd have to start going to the cinema again, I guess...). When it does come to gaming, though, even I stray from the true path sometimes. I bought two single-player games this year: Tanzia and Yonder. They both play like MMORPGs, which is what drew me to them and was how I justified hanging an "MMO" tag on the posts I wrote about them. I enjoyed them both, for a while. A short while. I don't have buyer's regret because they were cheap and I got my money's worth, but although I enjoyed the gameplay in both I found it utterly impossible to maintain my interest, knowing I was playing alone. It's hard to explain. Many have tried. In these days of solo MMOs, which is pretty much all of them if that's how you choose to play it, there's little logic to why doing exactly the same things has such a different emotional heft, but it does. Grinding xp or farming mats in a single player feels...well, let's be quite brutal...it feels idiotic. 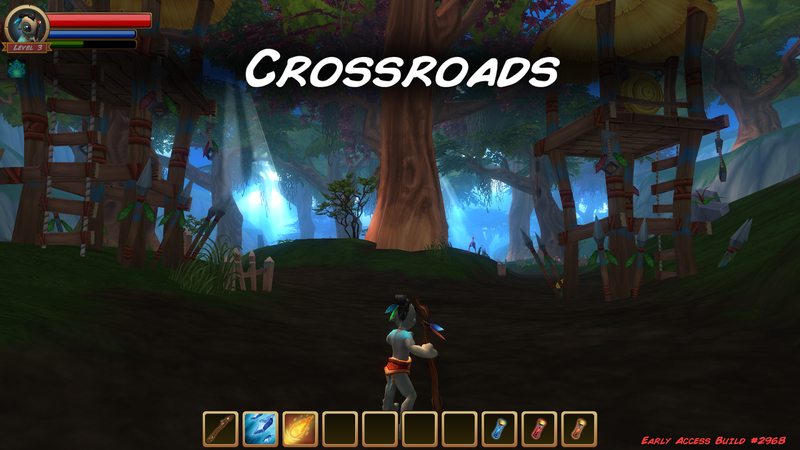 Tanzia and Yonder both feature those mechanics, which I enjoy in MMOs, but I had to stop playing because I began to feel that what I was doing had no function, purpose or meaning. After a few sessions I felt I would quite literally be better off spending my time staring out of the window, let alone getting up and going and doing something useful. To do exactly the same thing in an MMO feels completely different. Even in an MMO where no-one else appears to be playing, one where I know not a single person, where I'm in no guild or group, where the chat channels are silent for hours on end so it feels as though I might be the last person left playing. Indeed, I sometimes feel it literally would not matter if I was the only person left playing. I know that someone else could be playing and that's all that's needed to make it a social experience not a solitary one. So, after a couple of noble but failed experiments, I'm trying not to buy any non-MMOs, even if bloggers I read are singing their praises and they do sound like something I'd enjoy. But, what if the game in question happened to be free? And what if it only took twenty minutes to play? "I cannot tell you anything about this game, as it would ruin the experience, and in fact the mere knowledge that I cannot tell you anything about this game is already ruining a small part of the experience for you, for which I apologize profusely"
The game in question is called "Dr. Langeskov, The Tiger and The Terribly Cursed Emerald: A Whirlwind Heist". It's available as a free download (donations accepted) direct from creators Crows Crows Crows or you can get it free without guilt from Steam. I played it last night. It took me more like half an hour than twenty minutes. I played it again this morning and it took me more like forty minutes than half an hour. It is linear but stands repeating at least once - possibly more than once. More than that I shan't say. I don't think it is particularly the kind of game that would be ruined if you knew in advance what it was about but on the other hand, it takes twenty minutes to play (if you crack on) so if you want to know then you might as well just play it. Like I did. I think even I could manage a few bite-sized games like this without the scaffolding of an imagined social structure to hold up my interest. I'll keep an eye out for a few more. 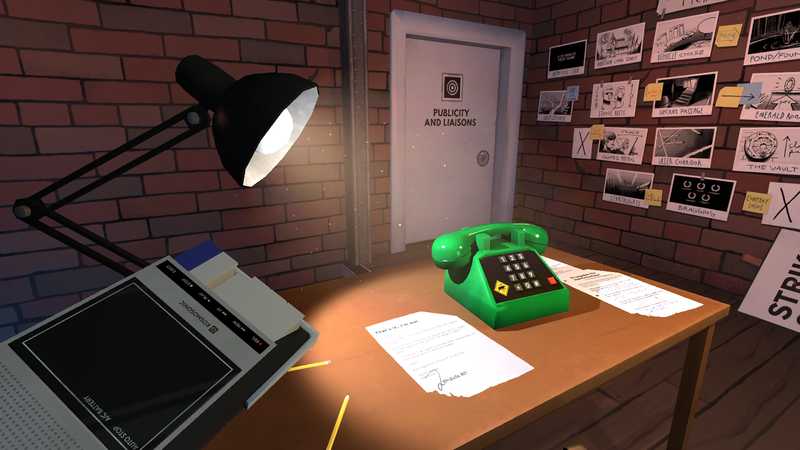 If you do play, one tip (not, I think, a spoiler): don't miss the tape-recorder. I didn't even see it first time round. I'd already taken my freebie from Evon Gnashblade's Emporium of course. It was a box of fireworks. I don't need a box of fireworks. I don't want a box of fireworks. I spent over two hours in GW2 yesterday just trying to clear some inventory space because one account bank is full and most of my characters have scarcely one empty bag. The main reason I was clearing inventory space was so I could run around and around The Mad King's Labyrinth hoovering up drops like it was an ARG. Bearing in mind I don't even like ARGs. Not to mention I already had 2000 Trick or Treat bags banked from last year. When I hit 3000 it occurred to me to open some. Mainly as a way of making space. Of course, that would mean my inventory filling up to overflowing with all the food, finishers, candy corn and plastic spider fangs. None of which I could remember the use for. Much of my Sunday afternoon was taken up with reading the wiki, trying to find out what you could do with all this stuff. Presumably it has some purpose. You'd hope. It took me another couple of hours but I finally worked out that most of it could be converted into other stuff at a rate of about 1000:1. Moreover, the concentrated versions go in the material bank. Well, so do the ordinary versions but of course I already filled those slots about five years back. I opened about a thousand bags. That was fun. I started off opening them slowly and looking at the contents then clicked faster and faster until by the end my mouse finger hurt. that consists of a fire effect surrounding your bare hand and which, not surprisingly, goes for big dollar on the TP. Not that I'll be selling it. It's unusual for me to get anything I immediately know I'll use. I just checked my main account bank and I currently have one hundred and eleven unopened boxes of armor, weapons or other items that require me to make a choice. If you add in the unopened boxes where no choice is required I have seven hundred and seventy four. Let's be honest - I have more stuff in every MMO than I want, need or know what to do with. I frequently bank reward boxes unopened because not only do I not have any use for their contents but I don't have anywhere to put them. If opening a box will clear an inventory space (because the box doesn't stack but the contents do, for example) then I'll open it. Otherwise it goes in the hole. And despite all that I still run towards free stuff, waving my arms and yelling "Gimme!" 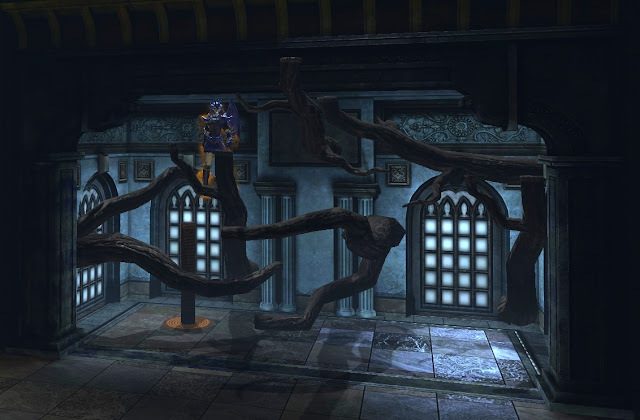 I logged into DCUO yesterday because I saw there was a free cat scratching post. Wait a minute? What!? So what? It's free stuff! And there's more. Stuffed bats! And dead tree branches! Wait, I can't breathe, I'm so excited! Also a free aura that makes me glow orange, which must be a Halloween thing because I got a trinket in GW2 with the same effect. Next thing you know, there I was, in my base, trying to remember how the UI worked, looking for a good spot to place my bats and my cat toy and my tree parts. They won't go with my free Flash gym workout gear, that's for sure. Lucky I have this massive, empty secret lair! Actually, it turned out to be more fun that it should have been. Hanging a bat, I hit twenty placed items, which removed the trainer wheels from my base-decorating skills. Don't have to use hooks any more. I can put things wherever I want. No time to ponder the possibilities - there's more free stuff to be had. I left the one I thought would be the best to last. 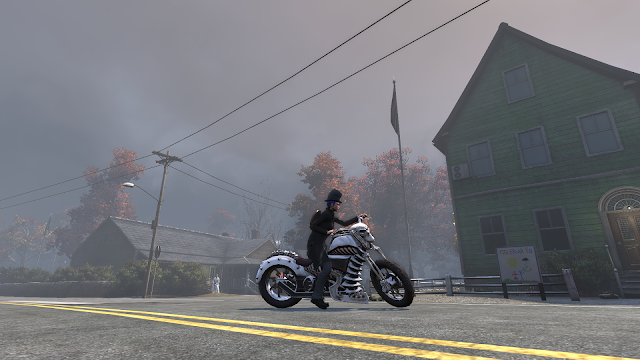 It's not every day you get offered a free motorbike but there's one with my name on in Secret World Legends. Not, sadly, literally with my name on. That really would be cool. Still, I have never had any kind of mount in TSW or SWL so it's a big deal. Also more patching because it's been a while. And more googling because I've forgotten how to take screenshots or where to find them after I've taken them. And I can't remember which key is "Sprint" (because riding a motorcycle is sprinting, of course it is...). I got it all sorted in the end. Then I revved up and roared off down the open road. Okay, no I didn't. I had Sprint 3 in TSW but that didn't copy across, apparently. I'm stuck with Sprint 1 for now, which means I putter along like a 1950s district nurse on a sit-up-and-beg pushbike. Also, the motorcycle handles more like a yacht in a stiff breeze than any kind of wheeled vehicle. But it's free stuff. Free stuff! And look, it had exactly the intended effect. I logged into all those games and I opened the cash shops in every one. Didn't buy anything but, hey, I might have! Hmm. I wonder if there's free stuff in any of the two dozen other MMOs I'm nominally still playing? Looking back at the posts I wrote about Heart of Thorns when it was new, what comes across more than anything is how surprised and delighted I was by just how much I liked it. My first-day impression was overwhelmingly positive: "The whole game feels like someone took it into the yard, ran the hose over it, washed off the dust then buffed it up until it just shines." My upbeat reaction to Heart of Thorns, which continued and indeed strengthened the further into the expansion I progressed, wasn't shared by everyone. 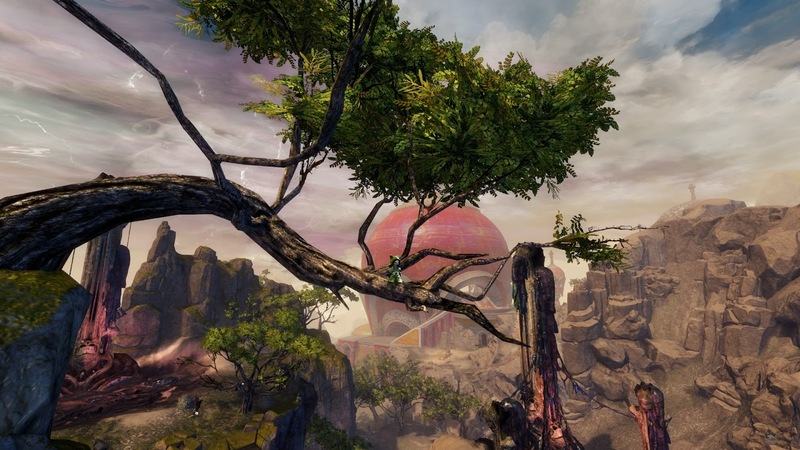 Over the course of the next six months there were course corrections aplenty as ArenaNet attempted to right the wallowing ship until finally the Captain was cast adrift and the crew turned back for safer waters. This time has been very different. The general response to the second expansion has been far more enthusiastic than the critical mauling the first received. 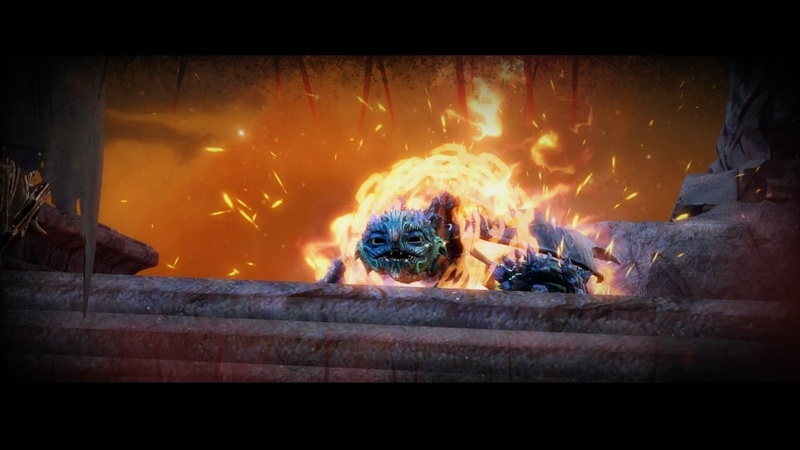 The forums are, by forum standards, warm and fuzzy and I couldn't begin to count the number of in-game conversations I've seen comparing PoF favorably to HoT. I regret to say that I'm not really feeling it. My loss, I'm sure. It's not that Path of Fire is in any way a poor expansion. It's not. It's perfectly fine. Fair value for money. Spectacular to look at. Entertaining. All of that. No, the problem is that, as I suspected almost from the outset, it doesn't have a hook. 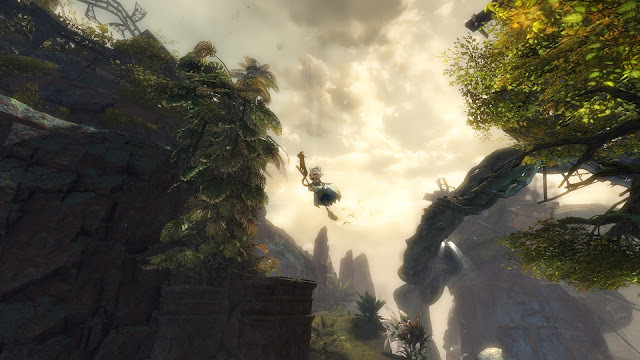 What's clear from my posts about Heart of Thorns is that for all its supposed problems GW2's first expansion dug its claws into me from the start and never let go. I found the change in emphasis exhilarating. Back then, when the furor was at its hottest, I wrote "I do believe these design decisions, which must be difficult to make at the best of times, have been taken with the best interests of the players in mind. Often players really don't have the clearest view of what's good for the long-term health of the game." That seems bitterly ironic in hindsight. Path of Fire represents a major retrenchment from the position taken by Heart of Thorns. It's easier and more accommodating. It's populist and crowd-pleasing. Mounts are the exemplar: far more so than gliders, they represent a marketable move towards the mainstream, as the enormously successful introduction of mount skins to the gem store at the first opportunity amply demonstrates. You could interpret all of this as a welcome move towards a less paternalistic, more egalitarian approach. You might say it's just giving the people what they want. You might recognize it as a business belatedly acknowledging commercial reality. Or you might see it as a climb-down of massive proportions, a battered and bruised team throwing in the towel in the face of unrelentingly hostile criticism. It's all of that and plenty more but what it undoubtedly is, more than anything, is a decision predicated on necessity. Heart of Thorns under-performed commercially as we know, unequivocally, from the subsequent NCSoft quarterly reports. 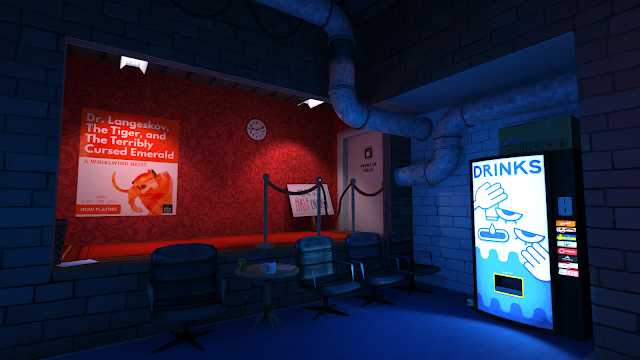 Making the game more challenging resulted in less money coming in. The hope is that making it easier will reverse that trend. The problem for me is that I never found Heart of Thorns to be in the least part "difficult" to begin with. I found it to be pitched almost perfectly to match my limited skills. 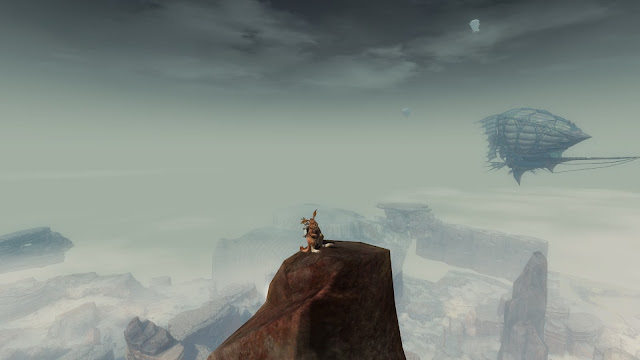 I described HoT as "solo heaven... a classic interpretation of the MMORPG solo experience" but I also loved the signature GW2 open raid play, which reached its apogee in the mesmerizing Dragon's Stand meta event. Filling out the then-new Masteries, opening the Elite specs on all eight classes and completing the lengthy and enjoyable collections for the associated Ascended weapons kept me busy and engaged for months and I was still eagerly running Dragon's Stand on new characters well into the following year. Indeed, once Heart of Thorns dropped, I didn't spend much time anywhere else in Tyria (other than World vs World) for a good, long while. That has very much not been the case with Path of Fire. It took a few sessions to finish the story, which was, at best, alright. A bit thin. Unengaging. Having seen it through, I have no desire to do it over on any other character. Certainly not now and quite possibly not ever. Acquiring the four advertised mounts turned out to be exceptionally simple. Completing the masteries for them has been quick and easy too, which is probably just as well because there don't seem to be many worth making the effort to acquire. Thin, once again, is how I'd describe that offer. If it wasn't for the hidden mount, the Griffin, the whole mount thing would have been a bit of a bust for me. The Griffin quest remains the highlight of my expansion experience so far. Shame it only lasted a handful of sessions. I wish it had been longer. Or per character not per account. Path of Fire does include a new, Elite specification for every Class, along with a Collection for a new Ascended weapon to go with it. Exactly the same set-up as Heart of Thorns, in other words, about which I was so enthusiastic last time. The difference is that back then I barely had any Ascended weapons. The opportunity to "quest" for genuine upgrades was exciting. Chances for meaningful, vertical progression in GW2 don't come along every day - or every year. This time around, I already have Ascended weapons for every character I play regularly and multiples for most. What's more, the new Elite specs for the classes I play most regularly don't appeal. I will not be changing from Tempest to Weaver or from Druid to Soulbeast so the new Ascended weapons would languish in the bank, unused. I'll probably get them in the end, just for the skins and to have something new to do, but therein lies the real problem. 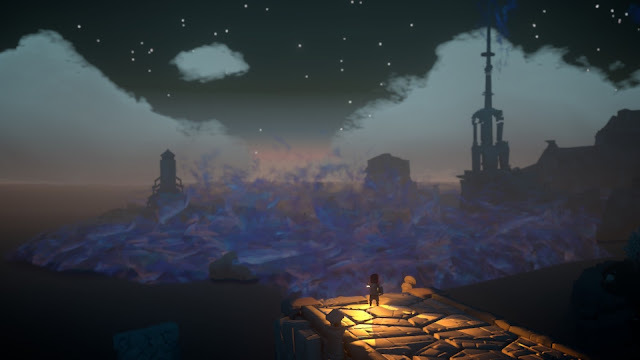 Path of Fire is fun enough but little or nothing in it seems necessary. I have the mounts but I don't use them if I can avoid it because they're awkward and clunky. I'd rather run. Or glide. I'm not excited by the new Elites. The new armor collections are, it goes without saying, hideous and unwearable. Exploring the maps is enjoyable, or rather it was, for a while, but once the visual novelty wore off I confess I began to find them a bit...samey. As I've said, I'm not much of a one for map completion, but I'll probably get it done eventually. It's hardly what I'd call a hook, though. It's not quite a month since Path of Fire launched and I missed the first few days, yet I already have the feeling I'm close to being done with it. Not with GW2, which I'm playing every day just like always, just with the expansion itself. 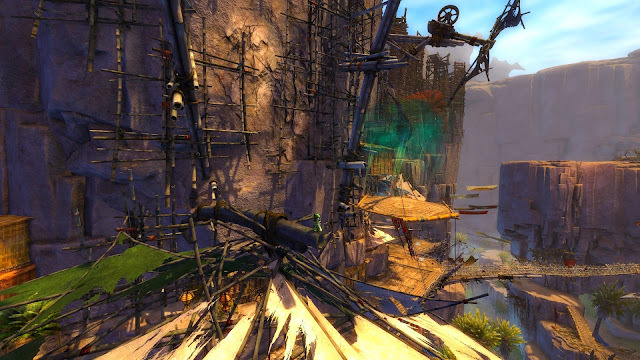 I'm spending most of my time either in WvW or pootling about in Core Tyria ot the Heart of Maguuma. I even did map completion in Bloodstone Fen the other day. I've gone back to doing The Maw and Jormag several times a week for no reason other than I like doing them. It'll be Teq next and Auric Basin. I miss the camaraderie of those huge events. Bounties, are no substitute for real World Bosses or map metas, that's for sure. And of course there's the Halloween event, Shadow of the Mad King, which is in full flow right now. There must be scores, maybe hundreds of instances of the Labyrinth running 24/7. I've been there more than anywhere this week, not because I need anything from the event but because it's good-natured, communal fun. 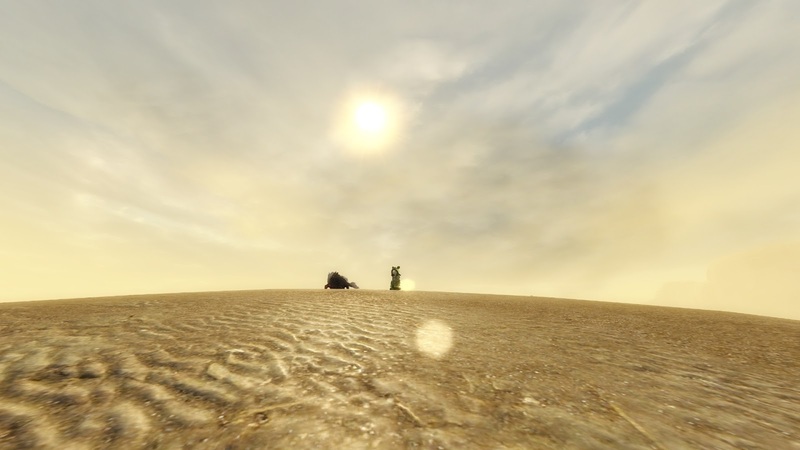 Maybe there's some of that, somewhere, in the Crystal Desert. I'm not seeing much of it but that could just be me. Thing is, I've spent so little time in any of the Path of Fire zones lately that I can't even estimate how popular they remain. Megaserver technology will ensure there are at least a few fullish ones for the foreseeable future, I'm sure, but unless and until some future update adds a compelling reason to travel I may not be there to notice. All of which isn't to denigrate Path of Fire as an expansion. It is, as I said, perfectly fine, as far as it goes. It's safe, unambitious and a little bit obvious but those aren't necessarily bad things. Not at first. In the good old days, when EverQuest knocked out a full expansion every six months, if you didn't particularly like one it didn't much matter. There'd be another along soon enough. Even nowadays EQ and EQ2 players only have to wait a year (not to mention the increasing feeling that we're fortunate to be getting expansions at all, given the age of the games). For GW2 it matters a bit more than that. Expansions are a Really Big Deal both in absolute terms for the immediate effect on the bottom line and as an increasingly rare opportunity to expand the audience via reviews, press coverage and word of mouth. 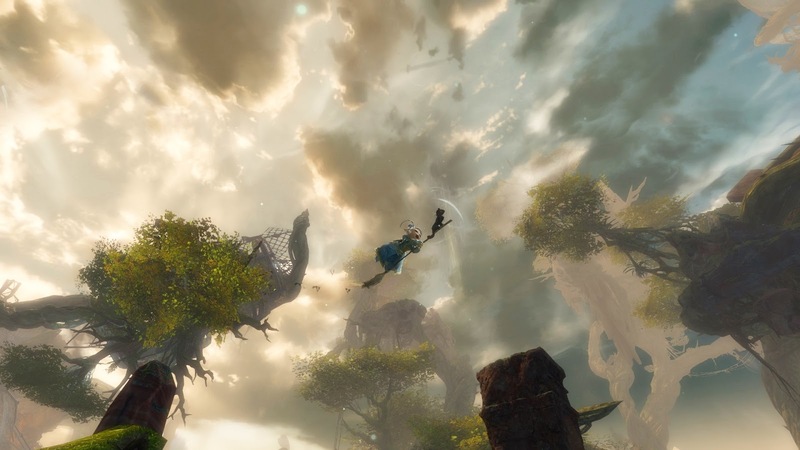 I'll be very surprised (and absolutely delighted) if we see GW2's third expansion before 2019 so, with a minimum two-year wait between them, expansions need to have staying power. I'm not convinced Path of Fire does. All MMORPGs are fiendishly complicated. Even the newest and freshest can be confusing and overwhelming but once you're a few years in and a few expansions up you don't just need an instruction manual - you need an encyclopedia. Fortunately, most MMOs that generate even the smallest degree of traction with an audience soon develop just that: a wiki. Wikis are great. I rely on them. They have one big shortcoming though: you can only look something up on the wiki if you know - or at least suspect - it exists. 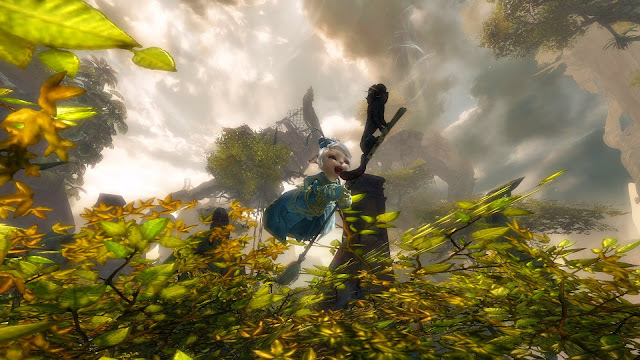 As the responses to my post about GW2's LFG tool demonstrated, you can be a very experienced and knowledgeable player with high level characters and hundreds, if not thousands, of hours played yet still be unaware of significant mechanics and systems in the MMO you're playing. I seem to find some new thing I didn't know about, but which has apparently been around for months or even years, every week or two. 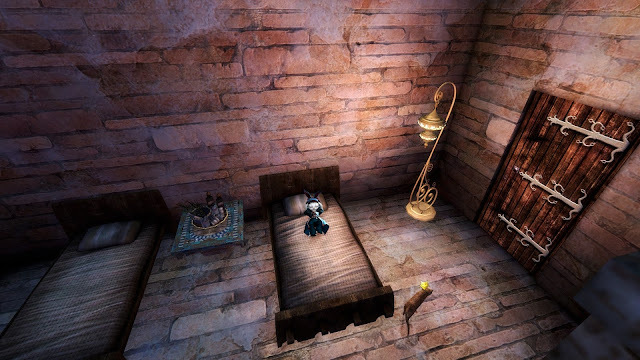 My latest revelation comes from EQ2 and since I know there are a few people reading this blog who play I thought I'd share it. It was a big surprise to me and it's something that's going to come in very handy indeed. With EQ2 Wire going into retirement and the Zam network having mothballed its EQ2 site, one of the few news sources still up and running is Niami Denmother's venerable and invaluable EQ2 Traders. It's always been the go-to for information and news on everything to do with tradeskills and decorating but it often pops up nuggets of more general interest. One such is yesterday's post on Fast Travel. Now, I did know that EQ2 has a form of fast travel that's almost identical to GW2's waypoint system but I'm guessing that even that may be a surprise to some regular players. For a while now, since 2013 I believe, it's been possible to open your map, click an icon on the map and be transported there instantly - or as instantly as loading times allow, anyway. Even though it's the exact same system I use every day in Tyria I've never used it in Norrath for one simple reason: it costs Station Cash each time. Not much SC, just a smidge, but still. It's always seemed like a bit of a waste, although given that I acquire SC far faster than I ever spend it I'm not quite sure in what context it would be "wasteful" to use it even on such a minor convenience. Well, as of this evening, when I read the EQ2 Traders post, that concern is flipped on its head. It seems that unlimited, free use of the Fast Travel system has for some time been one of the perks of All Access membership. Which I have. I just logged in to try it and it works just fine. Simply open the map and click the rightmost icon at the top of the screen, the odd thing that looks a bit like a feathered head-dress but which reveals itself on mouseover as "Quick Access Teleport". From there you get another map to select the zone you want. Next the zone map appears with the same orange feather thing marking every available travel point - bells, spires, druid rings and so on. Click the location you desire and confirm you really want to travel and off you go! Anyway, there it is for what it's worth: free Fast Travel for subscribers Members. No more using my Anchor of Wanderer's Dock to get to a bell, then using that bell to go Dropship Landing in Moors of Ykesha if the final destination is somewhere you can only get to by Spire or Ring. Wish I'd known that before I did all nine of Yun Zi's quests!